- don't you wish you were my student? For grins and giggles, I have included two samples at the bottom of this post. The first is for Level Three, which they have almost completed. The second is for Level Two - On the Road, which Zachary is also working on. Note that finishing On the Road Level Two is required to complete Level Four. I believe the Level Three checklist should be fairly straightforward. In case it isn't obvious, "Student" is the dog's name - with two dogs, one must keep the records straight. Now the On The Road checklist has extra lines for tracking locations where I have worked the boys. I write the name of the locations in the 1-10 lines at the bottom, and then just list the location number on the line next to the item itself. Anyway, I have a 1/2" sturdy three ring binder with nice plastic pocket dividers in it. 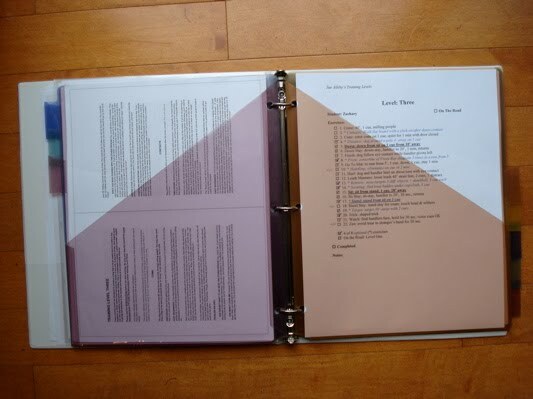 For each Level, I printed out the complete documentation from Sue's website and I put it in the back pocket of one plastic divider. I then print out two copies of the standard Checklist for that level (one for Beau and one for Zachary) and then two copies of the On The Road Checklist (which is the number of the level minus two). Those all go in the front pocket of the next divider. That way, when the binder is open, everything for one level is available. And there you have it - everything neatly bundled together and easy to whip out and look at or mark or whatever. I like the pocket dividers because I can pull things out and spread them out on the table. To read more about the various Levels in Training Levels (and if you haven't, I highly recommend you do!) then click HERE. For an overview, click HERE. 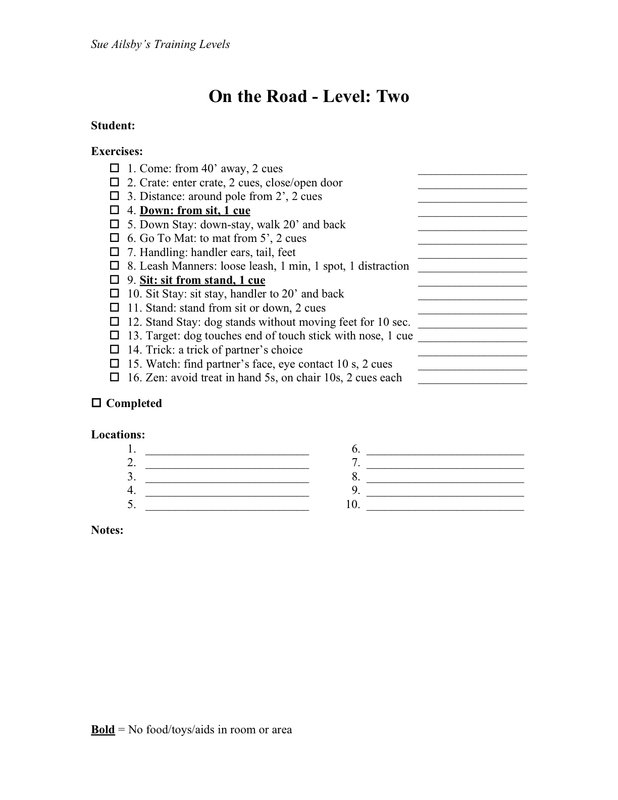 Note: I have now uploaded all 14 MS Word checklist files (7 Standard and 7 On The Road) and two PDF files (same thing, only grouped together by Standard and On The Road) to the Files:Levels checklists:One Page Checklists folder of the Training Level's group. Members of that group should be able to download the files from there.